Hey, all! 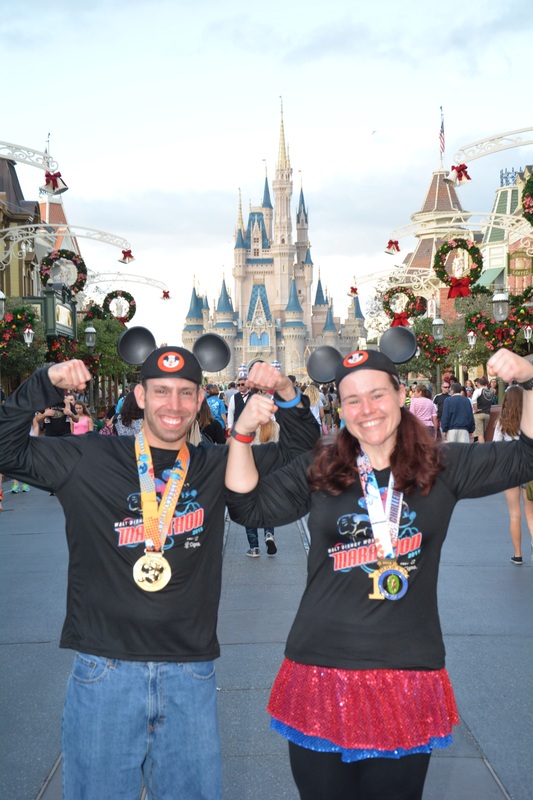 So we just got back from The World late last night, and I wanted to drop in to announce that Todd and I both successfully ran the Walt Disney World Marathon! And, that I completed the Goofy Challenge! I finished the half in 3:15 — slightly faster than my usual Disney half marathon race time of 3:30, haha. I’d mainly attribute that to the fact that there didn’t seem to be quite as many character stops (more on that later). I’m not gonna lie, the marathon took us quite some time to finish (over 7 hours). But, we stopped for about a ZILLION photos…honestly, we got pictures with almost every single character, plus stopped for a ton of other photo opps along the way. As an added bonus, the weather worked out beautifully for both races. In fact, it was pretty cold (in the 40s-50s!) for the half marathon, which was PERFECT for me. It was exactly the kind of weather I’m used to running in here in New Jersey…and it seemed only appropriate, given the fact that I was dressed like a certain snowman. The morning of the marathon was a little warmer (60s-70s), but the weather gods smiled upon me and it stayed pretty cloudy throughout the race — and it even rained a little bit, which felt like heaven as the temperatures were rising and we were fighting our way through those last 10 miles or so. As per usual, all of my usual self-doubt was for nothing. I did just fine. I’m not saying it was easy — and I definitely performed better during last year’s Dopey Challenge, believe it or not — but when you tackle something like a marathon (or a Goofy or a Dopey, for that matter) it’s impossible not to acknowledge to yourself just how strong you really are. To me, there’s NOTHING like running through Disney. And I know that has a lot to do with that little extra boost of motivation when I felt myself hitting the usual marathon wall in those final miles. But, at the same time, I don’t know how many marathons I have to run before I let myself admit that I’m strong enough to fight my way through ANYTHING. Plus, I’m super proud of Todd — he ran the Philadelphia Marathon just a few short weeks ago, and then took on yet another 26.2 with me this weekend. Of course, I took all kinds of photos, and I’ll be posting full recaps of our trip, the expo, and the races over the next couple of days. In the meantime, I look forward to hearing/reading all about your experiences! Did you race this weekend?! How’d you do?! Congrats to you both! 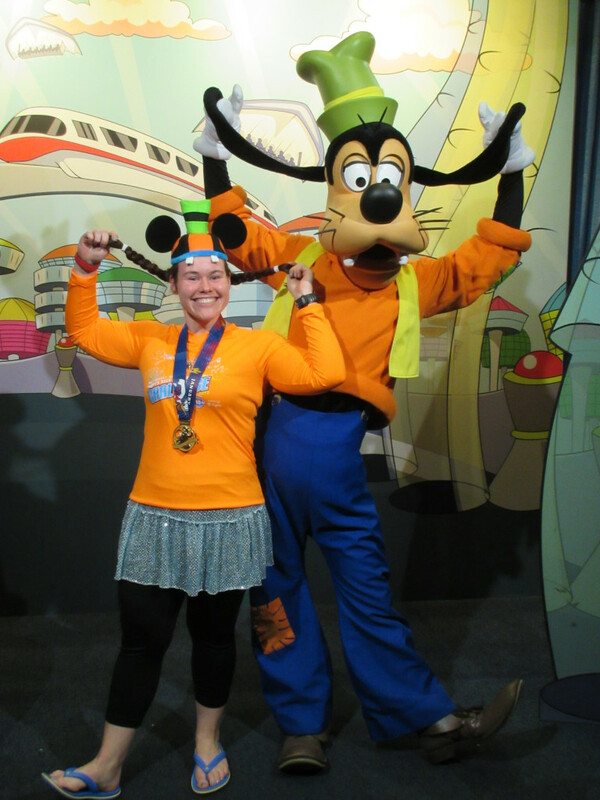 I also did the Goofy Challenge ( and my first marathon). I wish we would have ran in to you guys! Ahhhh, I know! That’s AWESOME! Doing Goofy or Dopey as your first full makes the victory just a little bit sweeter, right? I was definitely keeping an eye out for you guys — hopefully can catch up with you next time! I knew you could do it, and great costumes! 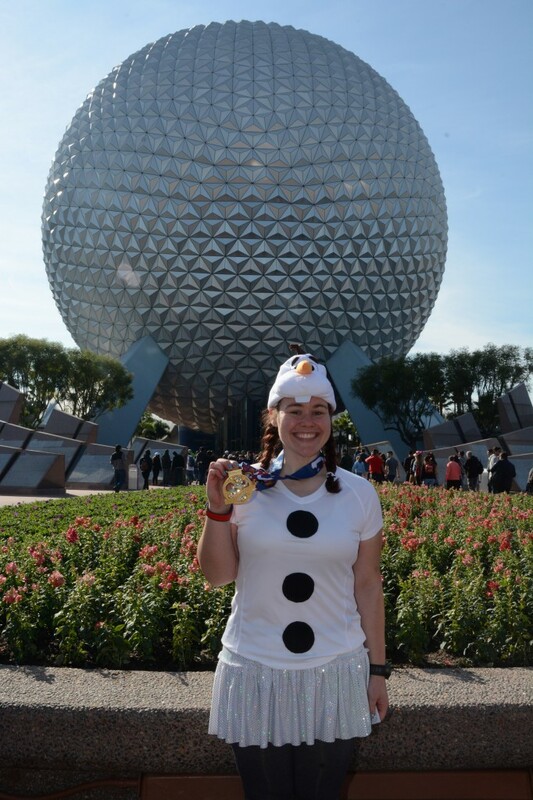 I’ve seen Olaf costumes from the 5k and did think cold weather is perfect for Olaf, wishing for summer. Aw, thanks! Hahaha, exactly! Turned out to be the perfect costume, lol. Awww, thanks! To me, putting the costumes together is a lot more fun than the actual running, haha. Thanks so much, Kelly! You can’t go wrong with a Little Mermaid theme. Good thing she has a few different “looks,” haha. Awesome job!! 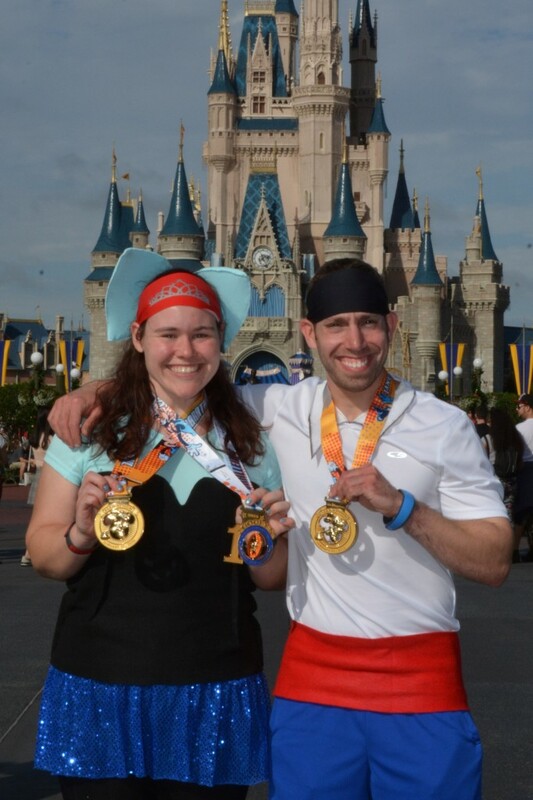 your costumes turned out great and congratulations on finishing the Goofy Challenge! Thanks so much, Lauren! I’m disappointed I didn’t get to see you guys! Congratulations! I love the Little Mermaid costumes. Glad the weather worked out for you! Look forward to hearing more! Aw, thanks, Karla! 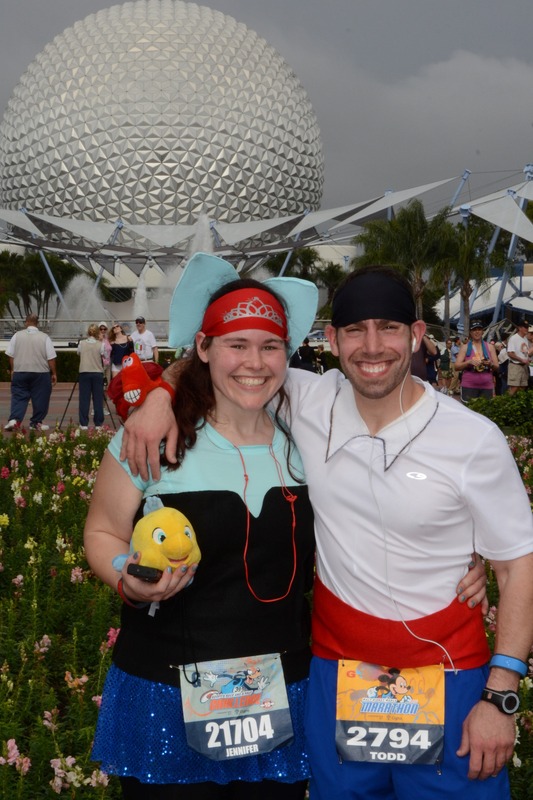 It was DEFINITELY the best weather I’ve had for a Disney race thus far…if only it could always been 40-50 degrees in FL! WHOOO! Way to go! I can’t wait to hear all about the races I love your Disney recaps! Aw, thanks! I love writing them…sometimes I even start mentally “writing” my recap during the race, LOL. Congratulations! Your costumes are too cute! Congratulations! It was so great getting to see you! I can’t wait for your recaps! Ok, so somehow I TOTALLY forgot you were going to be there or I would have tried to look for you! Congrats to both you guys and can’t wait to hear more about your races! Aw, really?!?! BOO. I’m never as active on social media as I know I should be when I’m there…having too much dorky Disney fun in the parks, lol. We’ll just have to catch up next time. Thanks so much — congrats to you, too! If you heard someone screaming “Go Jen!” around mile 23 (Hollywood Studios – by the Sci Fi Dine In Theater) – that was me! You looked like you needed a little extra boost of fairy dust so I screamed as loud as I could. Congrats on the Goofy!! YOU KNOW WHAT?! I kind of do remember that! I thought I’d heard my name somewhere in those last couple of miles, but then there are so many “Jens” in the world that I usually just assume it’s not for me, haha. Thank you, though, wish I would have seen you! If there’s ever a time for a little extra fairy dust, it’s in mile 23 of a marathon, lol. Congrats to both of you! No shame in taking over 7 hours to finish the marathon. I’m sure that each photo opp was worth it! Thanks, Kathryn! Oh, believe me, it was — I stopped for WAY more pictures this year! 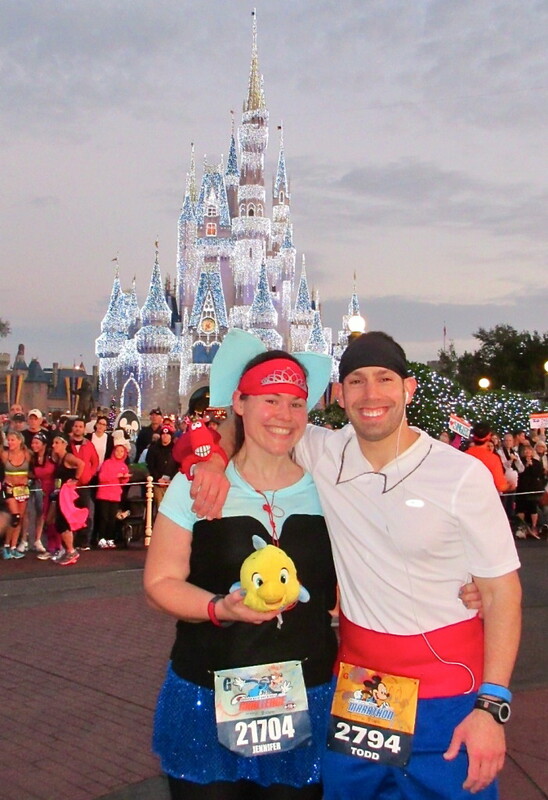 No regrets…it’s why I run Disney. Congrats to you and Todd. 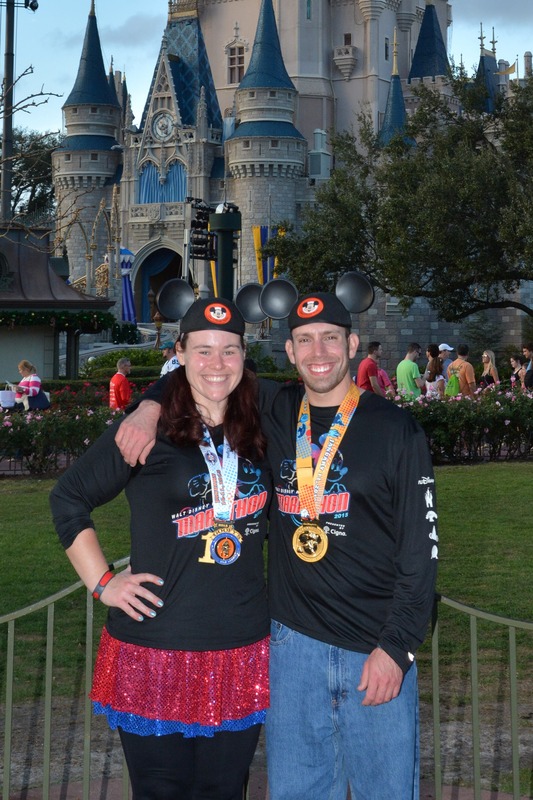 Another WDW Marathon weekend and you completed another challenge! 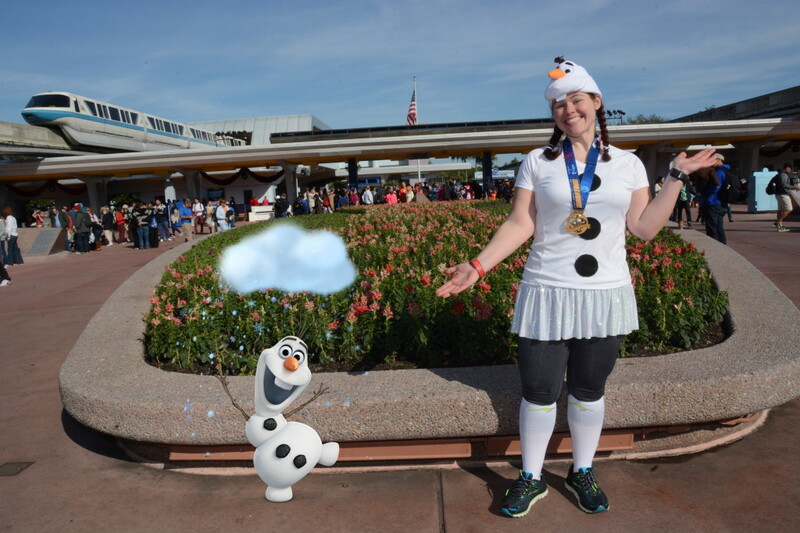 I love the Olaf costume….super cute! Aw, thanks so much! Gotta love that Olaf only required a couple of “buttons” and a hat — simple costumes definitely work best for me, lol. Congrats on being Goofy!!! 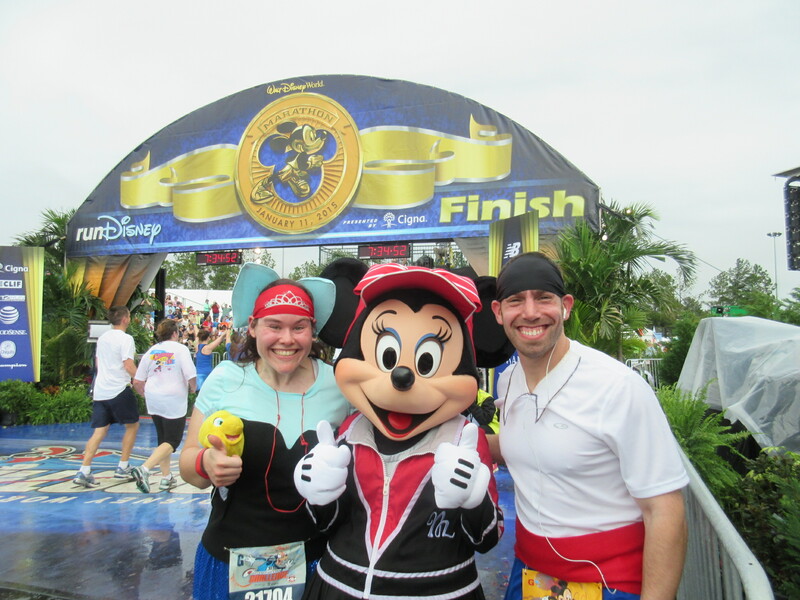 I am so in awe of all the Goofy runners – maybe next year! Thanks, Stacie! You could TOTALLY do it!